Written words never matter more than they do at the end of life. Expressions of joy and sorrow, the desire to connect with loved ones, ways of finding comfort for yourself and strength for others all are vital when time is short. But perhaps most pressing is the search for meaning. 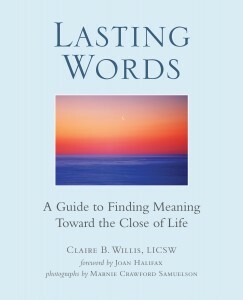 Lasting Words guides writers through their personal journeys to gratitude, hope, forgiveness, wisdom, prayer and, ultimately, saying good-bye.